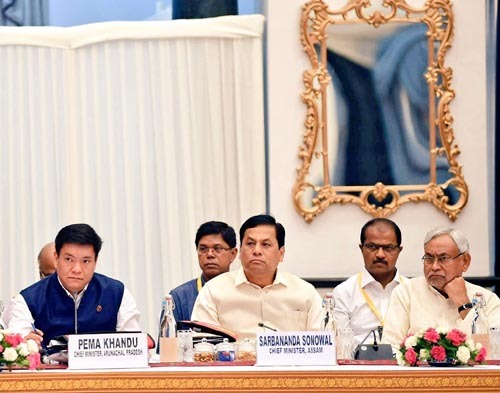 Chief Minister Sarbananda Sonowal attended the 4th meeting of the Governing Council of NITI Aayog, in New Delhi under the chairmanship of Prime Minister Narendra Modi on Sunday. Sonowal said that the Government of Assam gives utmost importance to implementation of the development agenda set by the Union Government to ensure faster economic growth of the state. Taking part in the meeting, Chief Minister Sonowal underlined the significant gains made in revenue collection and capital expenditure as well as implementation of different flagship schemes. He also informed about the measures taken up by the state government to ensure transparency and remove corruption in implementation of government schemes. He also informed that the transition to GST in Assam, has been hassle free. He further added that the state government has developed the seven-year strategy plan and three-year action plans for different sectors, keeping Sustainable Development Goals in view as advised by NITI Aayog. The Chief Minister also underscored the achievements made in implementation of national flagship schemes like MGNREGS, Ayushman Bharat, Pradhan Mantri Rashtriya Swasthya Suraksha Mission, e-NAM, Mission Indradhanush and Poshan Abhiyaan. Vice-Chairman of NITI Aayog Rajiv Kumar, several Union Ministers, Chief Ministers of States, members of the Governing Council, officials of the Union and the State governments were present.